Who invented Pizza? 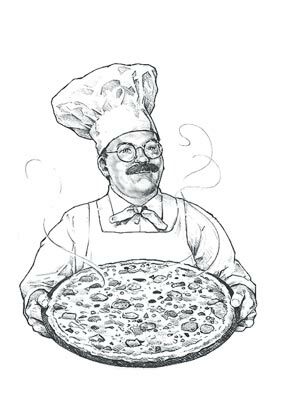 The name of the person credited with inventing Pizza is Raffaele Esposito (1885 - 1963). Raffaele Esposito gained fame as the Italian inventor of Pizza but was also as a baker and tavern owner. When was Pizza invented? Raffaele Esposito invented the modern Pizza in 1889, during the Second US Industrial Revolution / Victorian period of invention (1850 - 1914). The invention of the modern Pizza originated in Italy and has gained world wide popularity in the field of Food and Drink. Definition of Pizza: Pizza is defined as a round, baked open pie of Italian origin made of bread dough spread with a spiced mixture of and toppings such as tomato sauce and cheese. Who invented Pizza? Flat Breads: Derivatives of pizza were made in Ancient times in the form of various flat breads. Fact 1: Who invented Pizza? The Pizza was invented by Raffaele Esposito in 1889 during the Second US Industrial Revolution era of inventions (1850 - 1914) a delicious addition in the area of Food and Drink. Fact 2: Who invented Pizza? Prior to the invention of the modern Pizza in 1889 by Raffaele Esposito, many ancient civilizations had enjoyed a flat bread version of the dish. Fact 3: Who invented Pizza? The Ancient Greeks covered their flat breads, called 'plakous', with oils, herbs and cheese. Fact 4: Who invented Pizza? The Ancient Romans covered their focaccia flat bread, called 'panis focacius', with onion, cheese, vegetables and meat. Fact 5: Who invented Pizza? Many other ancient civilizations produced flat breads. The first Baker's Oven was made c. 4000 BC providing the Babylonians of Mesopotamian with a constant supply of flat breads. Fact 6: Who invented Pizza? The ingredient that changed the flat bread into a pizza was the tomato. Tomatoes originated in South America from the Andes and were first cultivated by the Aztecs and Incas c. 700 AD. The tomato was introduced to Europe by the Spanish Conquistadors in the 1500's. The first written account of a tomato in Italy dates to 1548 although many Europeans were extremely wary of eating tomatoes because they thought they were poisonous. Fact 7: Who invented Pizza? By the time the modern Pizza was created there were no such doubts about including tomatoes in Italian dishes. Fact 8: Who invented Pizza? Why is it called pizza? The name is believed to have derived from the Latin word 'picea' meaning a "blackened pie crust", perhaps because the first types of pizza were cooked in unpredictable wood-fired ovens. Fact 9: Who invented Pizza? Dishes similar to pizza were eaten by poor people in Italy to ensure that no left-over food ever went to waste. The world's first pizzeria opened in the town center of Naples, at Via Port'Alba, in 1830 and was called "Antica Pizzeria Port'Alba" and sold simple, cheap pizzas with toppings such as oil and garlic. Fact 10: Who invented Pizza? The inventor of the modern Pizza, Raffaele Esposito, was born on October 8, 1885 in Naples, Italy and died on December 25, 1963. Fact 11: Who invented Pizza? Raffaele Esposito is referred to as the inventor of modern Pizzas because he brought the pizza to prominence by making it an international phenomenon. So how did Raffaele Esposito achieve such a feat? Fact 12: Who invented Pizza? Raffaele Esposito was the owner of a tavern called Pizzeria di Pietro e Basta Cosi and had acquired a reputation as the premier pizza maker in the city of Naples. Fact 13: Who invented Pizza? On 9 January 1878 Princess Margherita of Savoy (1851 - 1926) became the queen of Italy upon the succession of her husband Umberto I (1844 - 1900) to the Italian throne. Fact 14: Who invented Pizza? The reign of King Umberto and Queen Margherita from 9 January 1878 - 29 July 1900 was quite turbulent. It was a time of social upheaval when anarchists plotted against the monarchy and men such as the young fascist Benito Mussolini began the Socialist Revolution and their rise to power. Feelings were so strong that King Umberto had been subjected to two assassination attempts. Fact 15: Who invented Pizza? In 1889 Queen Margherita visited Naples and against the backdrop of protests against the monarchy she bravely visited the local restaurants in Naples. Raffaele Esposito showed his loyalty to Queen Margherita by creating the "Pizza Margherita" in honor of the Italian Queen. Fact 16: Who invented Pizza? The "Pizza Margherita" was garnished with red tomatoes, white mozzarella, and green basil, to represent the national colors of Italy, as on the red, white and green Italian flag. Fact 16: Who invented Pizza? The Queen so enjoyed the "Pizza Margherita" that she sent Raffaele Esposito a letter to commend his pizzas, stating that they "were found to be delicious". Fact 17: Who invented Pizza? The invention of the "Pizza Margherita" by Raffaele Esposito spread quickly and became a fashionable dish for both the wealthy and the poor. Fact 18: Who invented Pizza? The story of King Umberto and Queen Margherita ended in tragedy when on 29 July 1900, Umberto was assassinated by the anarchist Gaetano Bresci, who shot the king four times. The American anarchist Leon F. Czolgosz claimed that the assassination of King Umberto I of Italy was his inspiration to assassinate the American President William McKinley in September 1901. Fact 19: Who invented Pizza? Queen Margherita of Savoy died in Bordighera, Liguria, Italy on January 4, 1926 at the age of 74. Her role as Queen of Italy has been forgotten but her name is ironically remembered every time some one orders a "Pizza Margherita". Fact 19: Who invented Pizza? Raffaele Esposito died on December 25, 1963. His restaurant still exists, although the name has been changed to Pizzeria di Brandi. The Queen's letter favoring Raffaele Esposito's pizzas remains proudly on display in the restaurant.